Your dog’s age will influence her behavior, which will evolve as she gets older. Today, discover what sorts of behavior you can expect from your dog at each stage of life. 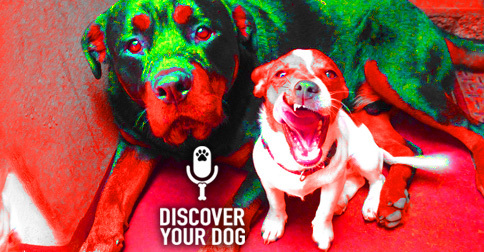 In this episode, we begin a trilogy of shows to shift our focus so you, the dog lover can have a broader knowledge and discovery of what it means to demystify your dog’s behavior so you can get the best out of your dog training! Imperative time in your dog’s life! Your dog is taken from its mother and siblings. This is when your dog really begins to develop its personality. Whatever your dog is exposed to during this time will shape how it behaves in the long term. Ep 081 Big Trouble with Little Puppy describes some of things you may want to pay to attention if you are getting puppy. This is the time Bennie gets most of his calls from his clients because they believe they should start training around 6 months of age. Bennie believes you should start training as early as 10 weeks old. Just like a human child, this is the time most dogs will start to get into everything and be a pest. Generally, at this point you have already developed some bad habits that will be difficult to break. However, this is a great time to start developing good habits as well. At this stage, your dog wants to show more independence (just like human teenagers). In a pack situation, this is when a dog will start to show if it is dominant without really challenging for the dominant role. Your dog will constantly test your leadership role. This is a time to show independence for a dog and allow some of that from your dog. However, you must maintain structure – even though you will receive some kick-back, stick to your guns because that is very important for them and to your relationship with them in the future. This is the time you realize that any issues or behaviors that you did not deal with during your dog’s earlier stages are not amplified! For example, dogs that growled or snapped previously are now biting – issue – amplified. This is especially true if you have not taken a leadership role with your dog. You may also notice your dog not taking commands that she has been willing to do in the past, or hesitation during walks, personal play time, or games the two of you used to play. During this stage, your dog may become much more aggressive. First, old age is just that – OLD AGE! Your dog has emotions just like we do and can become grumpy and less tolerant of things. There may also be pain associated with aging. In general, things must be done slower and more deliberately. Secondly, if your dog is dominant and you have younger dogs, this is generally the time the younger dog(s) may sense that it is time to take a higher or more dominant role in the hierarchy of your household. This can cause issues between all the dogs and yourself if you have not established that you are that leadership role. Knowing the age of your dog, to correct certain behaviors, you must also know what you want from you dog. Today’s homework focuses on going over a few behaviors and working on stating them in the affirmative. No matter what stage of life your dog is in, you can start practicing this. All the above items need to be relayed in the affirmative. For example, if you want your dog to STOP JUMPING UP, then you want her to do what? Stay on all four legs! Do this for any behavior you want to work on with your dog. When you can say the desired behavior in the affirmative, then you can look for it and then praise for it. Remember that your body language is also read by your dog. So, take that time-out if needed before you approach your dog because you do not want to reinforce bad habits. Check out our show page in iTunes to leave comments and subscribe or send us a message. 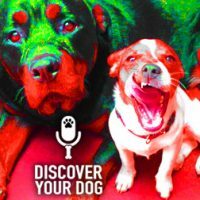 Discover Your Dog is a weekly podcast hosted by Leslie Hankins and professional dog trainer Bennie Copeland. They demystify your dog’s behavior so you can get the best results from your dog training. Send a note, drop us a line, or use smoke signals. We love it all.